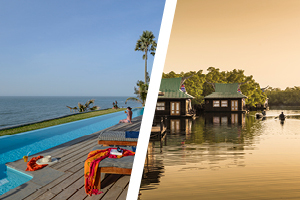 Over the years, we've come to the conclusion that the best way to see The Gambia - and to get a real 'feel' for the place - is to combine a stay at two, or even three properties. For us, tailor-made holidays are all about freedom - freedom to choose what suits you best, freedom to select from our finest hotels and our most dazzling properties; freedom to use your imagination and build the perfect holiday - with the help of our expert advice, of course. Combine a stay at one of our beachfront properties, say Coco Ocean or The Kairaba, spoiling yourself with drowsy afternoons snoozing or reading on golden sand and dining under the stars in the evening, with a trip upriver to the lodges at Mandina where you'll find spectacular natural beauty, beautiful accommodation and the very epitome of barefoot luxury. 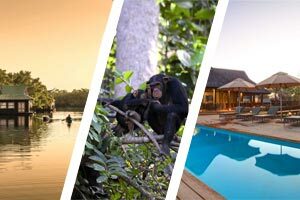 Combine 2 or 3 days upriver at Chimp Camp, a remarkable rehabilitation project where you'll see hippos and chimps in their natural environment, followed by 4 days of indulgence at Ngala Lodge, making the most of beautiful suites, magnificent views and one of the finest restaurants in The Gambia. Alternatively, a stay in luxurious safari tents at Fathala Wildlife Reserve in Senegal offers a perfect wildlife encounter. Why not combine 4 nights at Ngala Lodge with 3 nights at Fathala Wildlife Reserve on our Luxury Hotel & Safari Lodge twin-centre holidays? This is mouthwatering... why not try a few days at the friendly White Horse Residence, or adult-only Leo's Beach Hotel, both offering a beautiful location, a near-deserted beach and the last word in personal service, with a trip to neighbouring Senegal? The options this year are diverse - from game drives at Fathala Wildlife Reserve, to the Sine Saloum Delta and its stunning waterways rich in birdlife, both in northern Senegal. 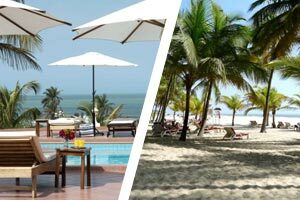 New this year is the possibility to drive south into the Casamance region of southern Senegal, offering fantastic French cuisine and stunning, white sand beaches. An increasing numbers of our customers are looking for something more than a traditional beach holiday and our Boutique and Unique properties offer endless combinations to try. However, as a specialist we are always looking for new possibilities to cater to our clients' desire to explore - very easy to do in such a small country. Perfect for couples looking for a romantic holiday, spend 4 nights at the unique Mandina Lodges, experiencing birdlife with wonderful guides and the peace of its river location. This is followed by 3 nights relaxing at the boutique Ngala Lodge, an adults-only hotel which is renowned for excellent cuisine, personal service and peaceful surroundings. 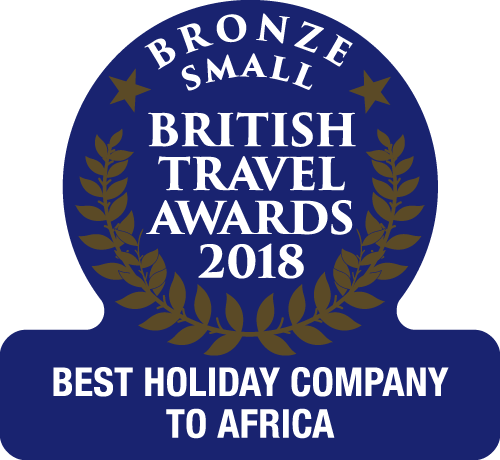 Enjoy a week of friendly relaxation in a stunning setting overlooking a deserted beach before travelling south into neighbouring Senegal for a week on a palm-fringed beach, enjoying French cuisine and a taste of a different culture - of course with the West African traditional friendly welcome. 3 nights HB at Mandina, 2 nights FB at Chimp Camp, 2 nights BB at Fathala. If you’re looking for a holiday to escape everyday life and truly appreciate the wildlife of the region, this could be the perfect holiday for you. 3 nights relaxing in style at Mandina Lodges followed by a journey upriver to see the remarkable Chimp Camp on the River Gambia and finally a chance to spot rhino, buffalo and giraffe whilst staying in luxury safari tents in Senegal. Why not combine your stay with Mandina Lodges or Fathala Wildlife Reserve? Fathala Wildlife Reserve (Senegal) 3 nights from £449pp on Bed and Breakfast, with excursion packages including a game drive and dinners also available.